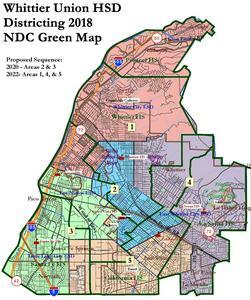 The Whittier Union High School District Board of Trustees has selected three draft trustee area maps to consider as the District transitions from at-large elections to trustee-area elections and members prepare to select a final map for adoption on Tuesday, Feb. 19. Following comments from the community during the Jan. 15 public hearing, as well as feedback taken during several community open houses and previous public hearings, the Board narrowed the number of draft maps for consideration from six to three. The Board of Trustees will adopt a final map from the following drafts: NDC Green, NDC Orange, NDC Purple. The community is encouraged to review and continue submitting feedback on the maps at the WUHSD District Formation Process website. Each map features a short description detailing the rationale behind how the trustee areas are divided. Once the final map is selected, the first election under the by-trustee area voting model will take place in 2020. Residents will vote for a single Board of Trustees candidate residing in their newly drawn trustee area, typically a fifth of the entire district. As part of the process, which began in October 2018, the District has hosted six community open houses and several meet-the-demographer sessions to ensure optimal public participation and engagement. The draft maps and comment boxes are available at the five comprehensive high schools, District office and at the WUHSD District Formation Process website. The Board of Trustees expects to select a final trustee map during a public hearing at 7 p.m. Feb. 19 in the Board Room, 9401 S. Painter Ave., Whittier. This meeting was rescheduled from Feb. 12. 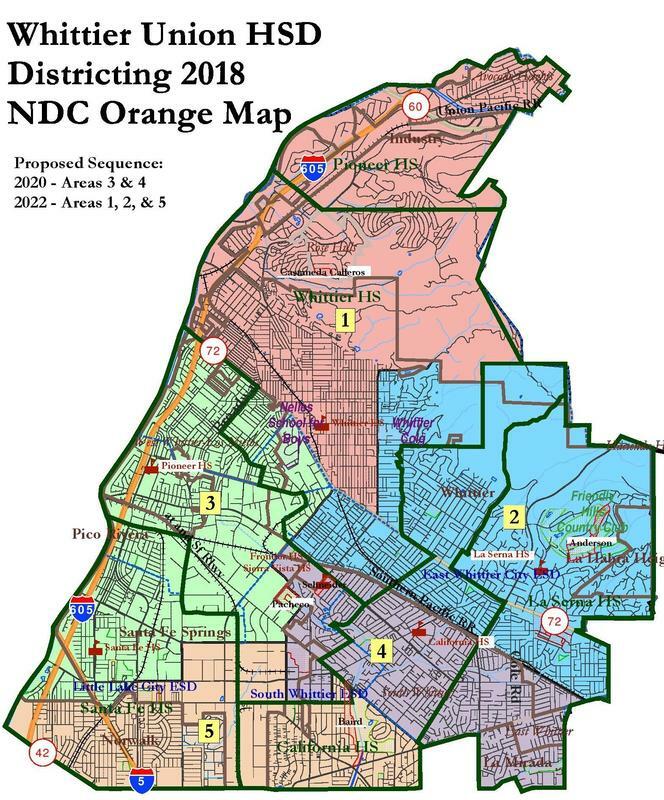 The approved map is expected to be presented to the Los Angeles County Committee on School District Organization following the meeting. The Committee will approve the map at a later date. For more information on the district formation process, visit www.elections.wuhsd.org.